Please, for those of you guys that have a lover that truly cares for you no matter how little your pocket is, do try and value these ladies because they are indeed God sent like Nollywood actress, Mercy Johnson Okojie. 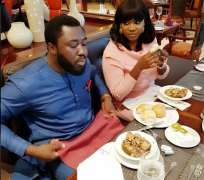 True love they say is hard to fine but for Prince Okojie, hubby to actress, Mercy Johnson, he is just one lucky man who will forever cherish the woman God has blessed him with. He is one gentle man that does not talk too much and could be classified as a shy person but when around his wife, he knows how to crack her up and also spoil her silly because the love keeps rejuvenating each day. Not every man will appreciate his woman the way Prince Okojie does but he is left with no choice because he understands what real love is all about as his woman has saved him cost of eating food outside which might end not being good for his stomach. Recently after eating at restaurant, Prince had to appreciate his wife’s effort in the kitchen knowing that there is nothing like a home-made food. “That moment you taste something different from the normal, and then I complained. "Baby all meal mustn't taste like mine" You just have to manage, says my wifey. My wife is the best cook, she fixes all my meals. I love you so much,” he wrote.